In this rare, behind-the-scenes look at what goes on in hospitals across the country, a longtime medical insider and international authority on childbirth assesses the flawed American maternity care system, powerfully demonstrating how it fails to deliver safe, effective care for both mothers and babies. Written for mothers and fathers, obstetricians, nurses, midwives, scientists, insurance professionals, and anyone contemplating having a child, this passionate exposé documents how, in the most expensive maternity care system in the world, women have lost control over childbirth and what the disturbing results of this phenomenon have been. Born in the USA examines issues including midwifery and the safety of out-of-hospital birth, how the process of becoming a doctor can adversely affect both practitioners and their patients, and why there has been a rise in the use of risky but doctor-friendly interventions, including the use of Cytotec, a drug that has not been approved by the FDA for pregnant women. Most importantly, this gripping investigation, supported by many troubling personal stories, explores how women can reclaim the childbirth experience for the betterment of themselves and their children. 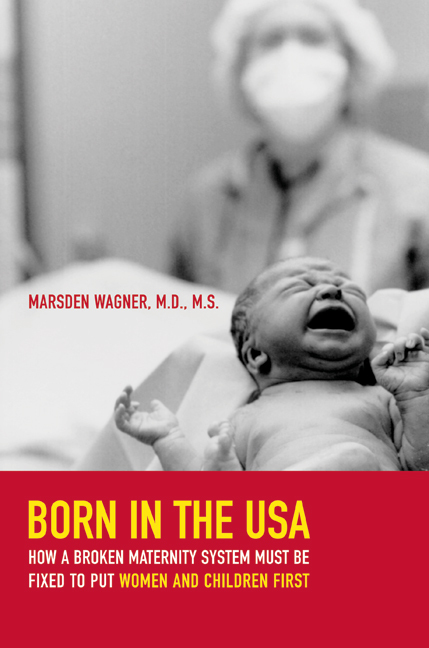 Marsden Wagner, a physician and scientist, is a former Director of Women’s and Children’s Health at the World Health Organization and a recipient of an Alumnus of the Year Award from the University of California at Los Angeles School of Medicine. He is author of many books, including Pursuing the Birth Machine: The Search for Appropriate Birth Technology and Tough Choices: In Vitro Fertilization and the Reproductive Technologies. 1. Maternity Care in Crisis: Where Are the Doctors?